You’ve spent hours on Bowsite.com talking to fellow bowhunters, asking questions and researching all of the info available. Your goal - To find your next bow! Finally, you traveled to the closest pro-shop or shopped on-line and made the purchase. Now you have the task of outfitting your new rig. Two of the items on your list will most likely be an arrow rest and a release aid. The choices are many with well-known companies building on their successes and newcomers giving it all they have to win your business. 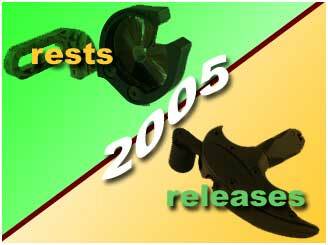 In this feature article we have spotlighted several new releases and rests for 2005. Click the buttons below for each.